← FIFA 2014 World Cup in Brazil – A Game Changer? It seems spring has come and is gone already. Either that or time flies when you are busy riding, busy at work, busy researching for blog posts, and also spending some time abroad in this mix. But I’ve managed to put more than 2,000 miles between the Triumph and the Ducati this year already! The Yamaha has not been touched yet, though. Will it ever? I’ve spent more time with the Triumph Tiger this year than the last two years, when I was obfuscated by the Ducati fever. But things are settling down now, and I had a chance to re-discover the qualities of the 800XC on road and off-pavement. That doesn’t mean that I have lost my passion for riding the Ducati, that seems impossible to be extinguished. Riding the Ducati is always something special. There is something about the sound and the vibrations from that V-Twin. And of course, the performance, which is night and day when compared to the Triumph. It’s a funky looking bike. Shaped from a mix of motard, touring, and enduro styles. But it works best as a sport-touring bike. And when you don’t push it hard it can deliver an astonishing fuel economy for the performance vehicle that it is. For example, on a recent trip to Auderhaude Rd and then up the Cascades to Sisters, I filled the tank in Sisters. On my way back home, the bike delivered an average consumption of 53.3 mpg, at an average of 59 mph, from Sisters back home. Yes, it was downhill. Still, better than a Prius, which I consider the benchmark for fuel consumption. 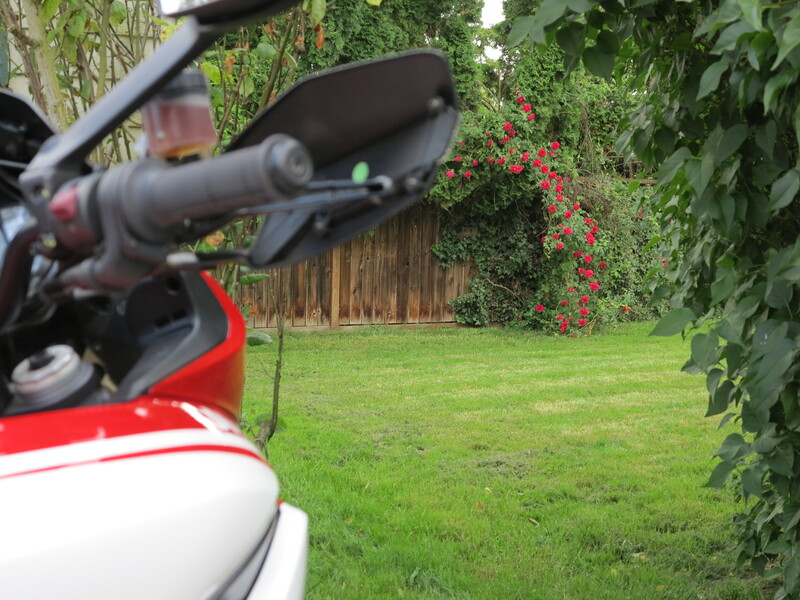 The Ducati can actually deliver better fuel economy than the Triumph Tiger, at same level of riding speeds. But the Triumph is a much more relaxed motorcycle. 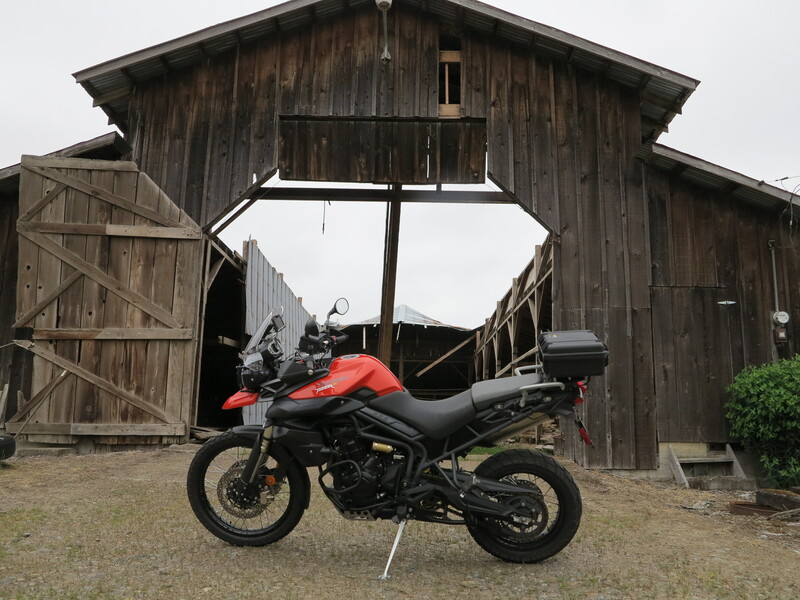 It is the easiest motorcycle to ride, from all motorcycles I’ve had so far. Acceleration, braking, clutch and transmission, everything is smooth and gradual. Its biggest downfall is the windscreen. It really needs to be changed or tweaked or something, and I don’t know why I haven’t done something about it yet. It generates loud buffeting at any speed above 45 mph. I took it on June 1st to the Cycle Parts’ Ona Beach lunch. Thanks, Rod, the hamburger was so good I had no chance but get on the line again for more! 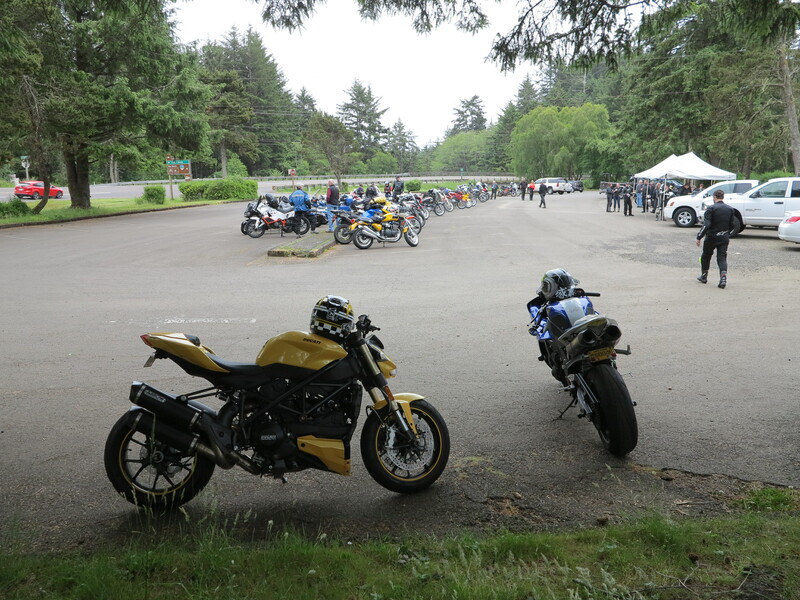 While there, someone with a Yellow Ducati SF848 showed up. Good to refresh my memories about that bike. The newest bike there was a KTM Super Duke 1290. This thing looks and sounds serious. KTM is finding their way into the street bike market. They even modified their big enduros giving them more street flavor with their 1190 Adventure bikes. Now they are taking the SuperDuke to a new performance level. What’s next? I bet they will have something to take them back to their main vocation… what about a mid-size V-Twin rally type, real enduro bike? They would not vacate the spot they left behind after closing the 950/990 Adventure line. With these thoughts in mind I went back home from that trip to Ona Beach and stopped at the Heceta Lighthouse, it’s always there, like an old friend. 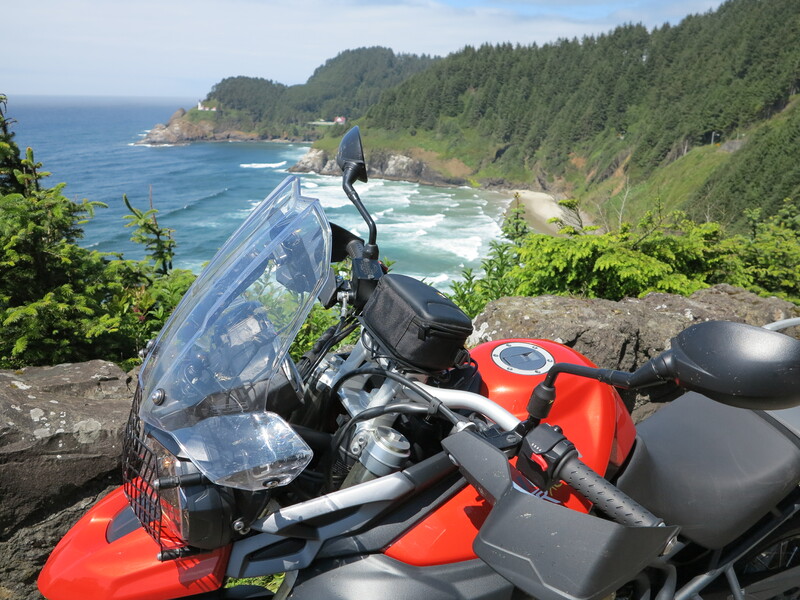 The Tiger and the Heceta Lighthouse. 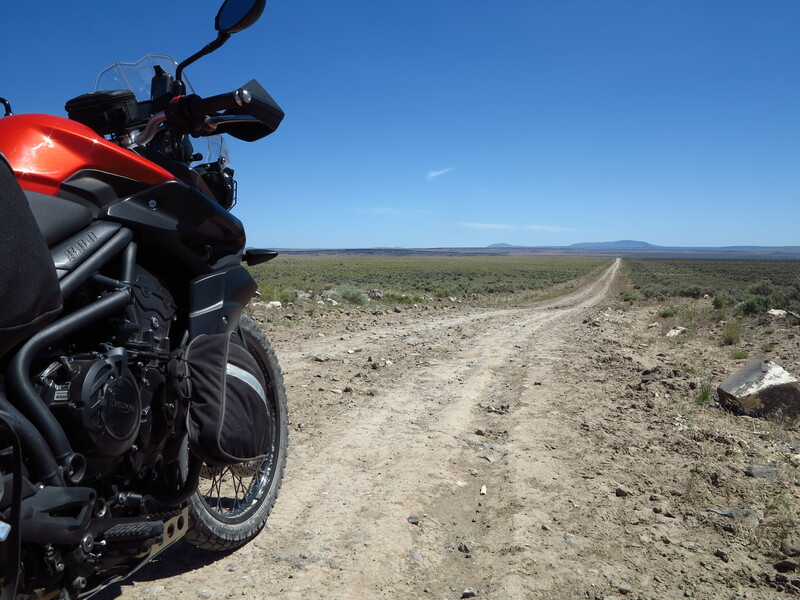 Coming soon: The Tiger’s impressive and aggressive performance on dirt on a trip to the Steens. On the other side of the equation there were mosquitoes and grass seeds (allergies!) as well. Coming Soon! An Impressive performance by the Triumph Tiger, as well as a major shortfall. Has the Triumph managed to push the Yamaha away from the shed? Stay Tuned! 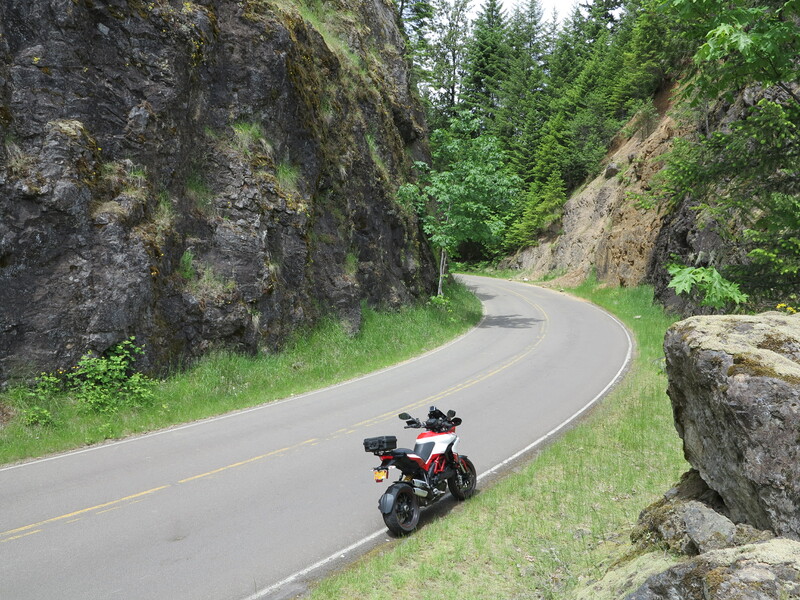 This entry was posted in Riding the Ducati, Riding the Triumph. Bookmark the permalink. Grass seed allergies, one of the reasons I don’t do much riding in June. Great pictures – as always. I was wondering if you would be at Day to Ona. We didn’t this year as Brad was teaching a Team Oregon class. I do believe the KTM is our friend Luke’s new bike. He sure loves it more than the big Kawasaki he was riding. You probably know my friend Kyle, who works at a restaurant in Corvallis and teaches at Team Oregon every now and then. 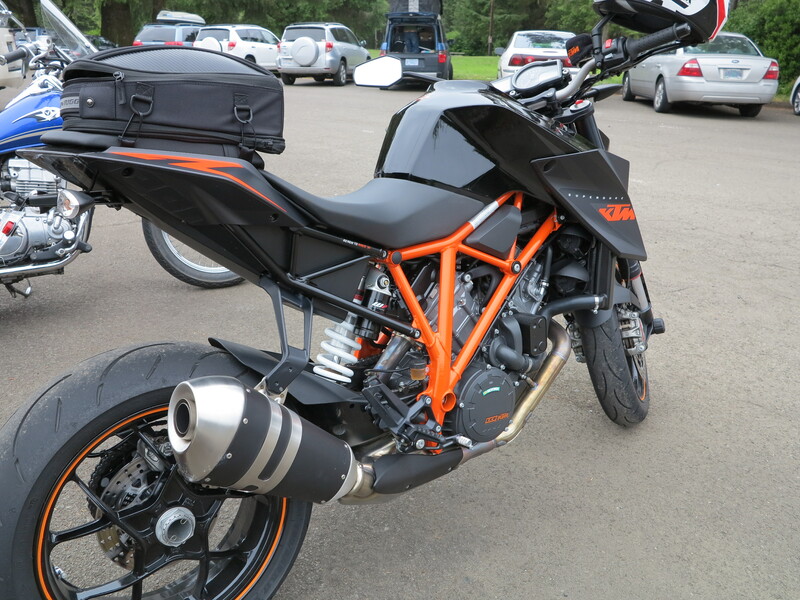 That KTM 1290 is quite a bike! Too bad you guys did not make it to Ona Beach. nice post and nice pictures as always. Remember the question about the gears? Actually I did change the pinion from 16 to 17, and I like the change. I don’t really feel the difference on low gears, and on the other hand I can see the difference when I am cruising at 100-120 km/h with a bit lower rpm. I still do not understand why Triumph made this choice of gears, with 5th and 6 being almost the same. I even wrote to Triumph yesterday asking this same question… still waiting for their reply. Anyway, apart from this I like the byke very much, I also used it on medium difficulty off road and I was surprised to see how well it handles, once I got used to the weight…coming from the WR250, and considering the original tyres which surely are not ideal for off road use. Regarding highways, you were mentioning that it sounds like I would be doing a lot of those, actually I do all I can to avoid them when I am riding since I don’t like them at all on a motobyke, but still, even on secondary roads, I like to have a longer 6th when I am cruising on ther “strade statali”. 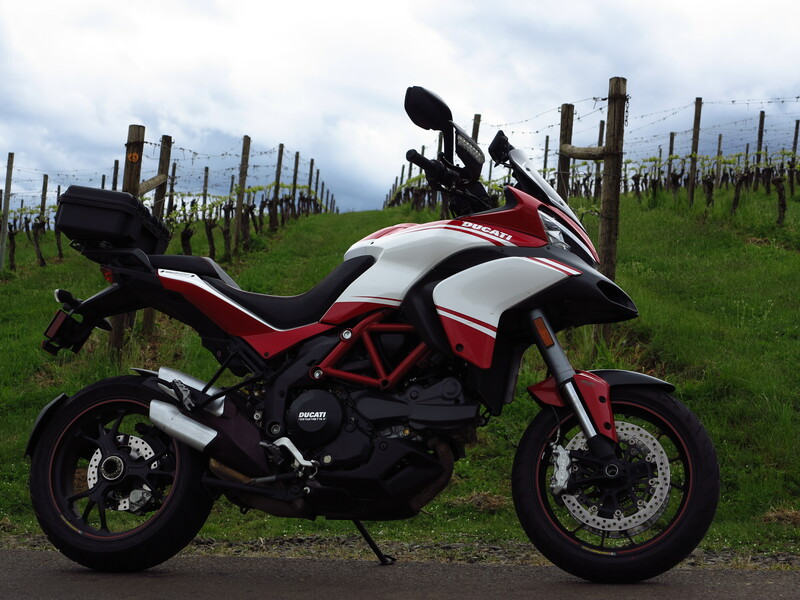 Let me know if you happen to travel to the North of Italy some time, it would be a pleasure to organize a ride in the region to show you some nice roads and places, we can easily find a Tiger or MTS for rent in this region. Thank you for the update Dario. I’ve been thinking about riding in the north of Italy at some point. The Dolomites sound great, especially being the region of my name surname (and where my family comes from, Fonzaso and Agordo). 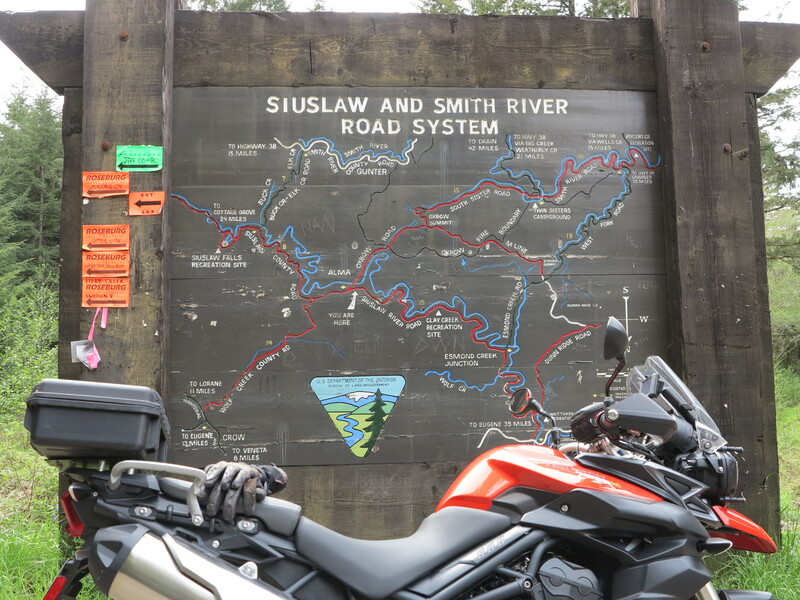 You should check this space as I’m preparing a post on a recent ride when I took my Tiger 800XC to the high desert in Oregon. The machine did a great job! I have videos to share, and photos of the maintenance I did to it after the ride. Stay tuned!